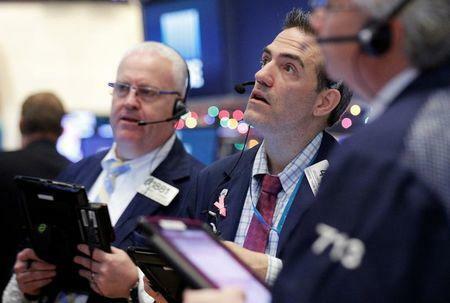 NEW YORK (Reuters) - U.S. stocks rose on Monday on strong economic data while currency and bond investors shrugged off Italian Prime Minister Matteo Renzi's resignation, following voters' rejection of his constitutional reforms. U.S. Treasury yields fell in choppy trading on Monday as investors viewed the dramatic bond market selloff following Donald Trump's surprise U.S. presidential win as overdone. The Italian referendum stoked worries about Italy's political stability and its banking system but financial markets recovered from an initial fright with stocks and the euro rebounding as fears of an imminent election ebbed. Election results from Austria also helped ease investor jitters. "It was a neutral day in Europe because neither the far right nor the far left made any headway," said Robert Phipps, director at Per Stirling Capital Management in Austin, Texas. U.S. stocks rose, led by financials as the S&P's banking subsector <.SPXBK> erased Friday's losses with a 1.7-percent jump. Banks were lifted by investor bets on a Federal Reserve decision to raise benchmark U.S. interest rates next week as higher rates would help banks, Peter Tuz, president of Chase Investment Counsel in Charlottesville, Virginia. Rising oil futures for much of the day helped the S&P 500 energy index <.SPNY>. Also helping U.S. stocks was data showing U.S. services sector activity hitting a one-year high in November, with a surge in production boosting hiring. The Dow Jones industrial average <.DJI> closed up 45.82 points, or 0.24 percent, to 19,216.24, the S&P 500 <.SPX> had gained 12.76 points, or 0.58 percent, to 2,204.71 and the Nasdaq Composite <.IXIC> had added 53.24 points, or 1.01 percent, to 5,308.89. The benchmark U.S. 10-year Treasury note yield was down 0.5 basis points at 2.385 percent, while the 30-year bond yield was 1 basis point lower at 3.051 percent. European markets took some encouragement from a sound defeat in Austria's presidential election of a far-right candidate by a pro-European despite forecasts of a tight race. Peter Cardillo, chief market economist at First Standard Financial in New York, said that the euro's strength will likely not be sustainable as speculators look to profit from political instability in Italy as it decides on its next prime minister. "This calm before the storm will shortly be challenged by another wave of speculation," Cardillo said. The euro rose 0.9 percent against the dollar to levels not seen since Nov. 15. It had hit a 20-month low of $1.0503 earlier in the day. The dollar index, <.DXY>, which tracks the greenback against a basket of six global peers, was down 0.7 percent at 100.11. Europe's FTSEuroFirst index of leading 300 shares <.FTEU3> had ended up 0.6 percent and Germany's DAX <.GDAXI> rose 1.6 percent. In oil futures, Brent crude rose above $55 a barrel for the first time since July last year after last week's OPEC production cut agreement. It settled up 48 cents at $54.94 but slipped to $54.22 after settlement. West Texas Intermediate (WTI) crude traded down 67 cents, at $51.01 a barrel.